What whinnies like a horse, kills its brothers, and is no bigger than a pint glass? An Eastern Screen Owl, of course. This tiny bird hides by day in the nooks and crannies of trees, but by night its strange whinnying call sounds in farmlands, suburbs, and city parks, throughout the East Coast, Midwest, and Southern United States. It can be said that they don’t make great neighbors. Their home lives are tumultuous: nestlings fight each other so savagely over food that the youngest is often killed. A female taken as a second mate by a male will evict the first female and take over the care of her eggs. They don’t build nests; instead the female selects a nesting cavity, sometimes an abandoned woodpecker hole, and simply lays her eggs. If the cavity is filled with debris – droppings from a previous inhabitant, cast off feathers – she’ll willingly raise her children in it. 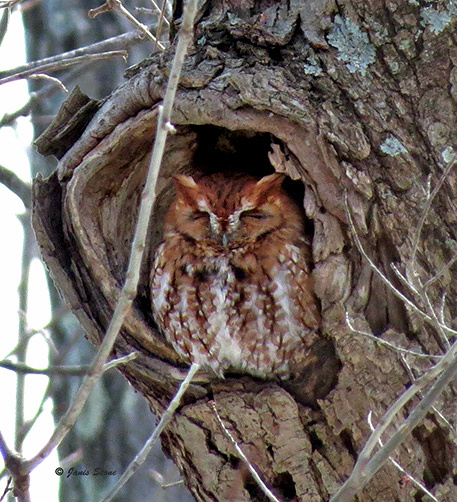 Eastern Screech Owls eat small birds and mammals, worms, insects, frogs, and tadpoles, after which they cast pellets, or regurgitate bones, fur, and feathers in oval lumps. If other foods are scarce, they have been known to turn cannibal. Their one good habit is thrift: when food is plentiful, they will cache it in tree holes for up to 4 days. 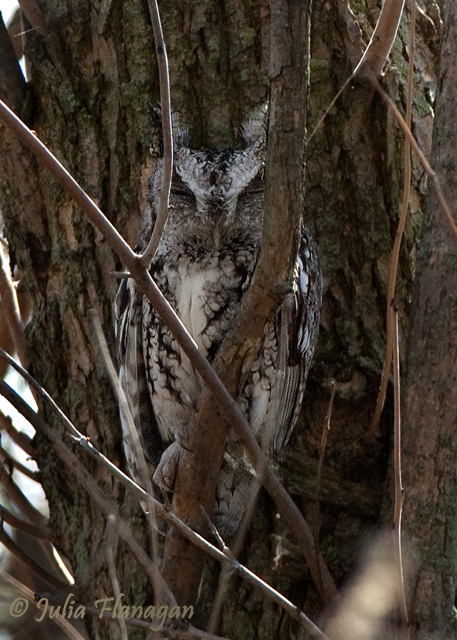 They do not migrate, and their grey or reddish brown coloring provides excellent camouflage against tree bark. Because they aren’t choosy about their food or homes, the owls adapt well to human surroundings and may live longer in the suburbs than in the wild.